Schult Timberland 6432-401 | Excelsior Homes West, Inc. If you are looking for a spacious rambler, the Schult Timberland 6432-401 may be the home for you! 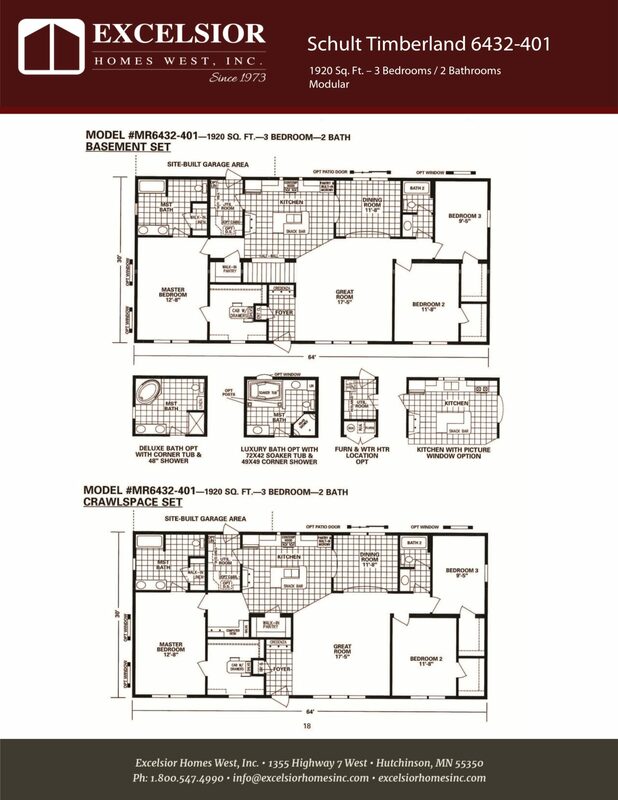 The Schult Timberland 6432-401 has just over 1900 square feet of living space with three bedrooms and two bathrooms. The great room is open to the dining room and kitchen. This floor plan’s kitchen has many storage options. With a pantry above the built-in microwave and another walk-in pantry, you will have plenty of room to store your groceries and kitchen appliances. This kitchen layout also has a large island with a snack bar for more seating options when entertaining family and friends. Contact us today for the price of this Schult home! With the Schult Main Street 6432-401 floor plan, you can choose from available options to make this home your own! The Schult Main Street 6432-401 can be built as a modular or manufactured home. You also have the choice between different options to help make this home your own. With this home’s master bathroom, you can choose between the standard, deluxe, luxury, or majestic option. You also have the choice of flooring, countertops, fixtures, and lighting in each bathroom option. Stop by our location in Hutchinson, Mn to see all the upgrades we have available. We can help you find your dream home!